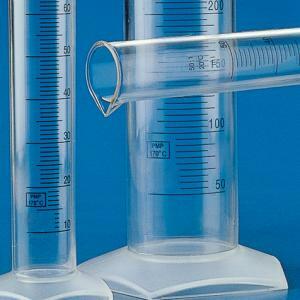 Next Day Science's high quality plastic cylinders are optimal for the accurate and safe measurement of all types of liquids. Designed for easy filling and pouring, the non-wetting interior surface eliminates concave menisci, providing more accurate measurements. The heavy duty plastic withstands repeated autoclaving. Switching from glass cylinders to our plastic cylinders will greatly reduce the potential for injury and breakage. For more information, see individual product's specifications and features. PP is short for polypropylene. 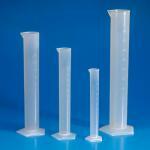 Many of our cylinders are made from polypropylene and can be identified by their translucent coloring. Polypropylene is a product particularly suitable for research and laboratory applications because of its durability, and ability to withstand repeated sterilizing and autoclaving. PMP is short for polymethylpentene. These cylinders are crystal clear. PMP has all of the qualities of PP (durability, easy to handle, ability to withstand repeated sterilizing and autoclaving), but is clear like glass and can withstand higher temperatures. 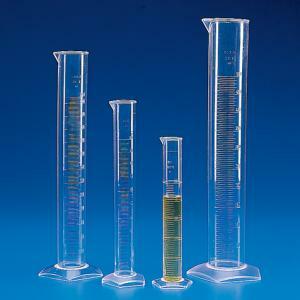 Which is better for graduated cylinders, plastic or glass? The development of PP and PMP have made plastic the ideal choice for laboratories and research facilities. These plastics are lightweight, durable, and easy to use. Both PP and PMP provide protection against breakage which saves money on replacement costs and protects users from injury due to broken glass. What is molded graduation? What is printed graduation? 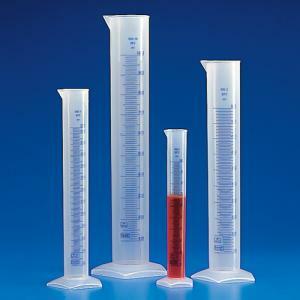 Molded and printed graduation refer to methods used to mark measurements on a graduated cylinder. Molded graduations have the divisions and measurements etched into the cylinder, providing a permanent record that will not fade with repeated use and autoclaving. Printed graduation involves printing the divisions and measurements onto the cylinder with little impact to the surface.